Oats are a cereal grain,seeds from a plant. It's tough to find a horse that turns his nose up at oats, so odds are yours will dig in with gusto. As a horse owner, acutely aware of the ever-present risk of colic, you'll take comfort in knowing that oats are an easily digested source of energy and nutrients for your horse. Many feed stores sell whole, rolled or crimped oats for horses, and these varieties are 9 percent to 12 percent protein. Your horse needs protein to develop his muscles when he exercises or, if he’s young, while he’s growing. Naked or hull-less oats are much higher in protein, about 15 percent to 20 percent. If your horse is mature, the lower protein content is sufficient; but a younger horse, or a pregnant or nursing mare, will benefit from the higher content. If you want this extra protein, don’t confuse hull-less oats with dehulled ones, which can have damaged kernels due to the processing mechanism. Two important amino acids for your horse are lysine and methionine -- they are the building blocks of protein. A deficiency in either of these can affect your horse’s performance, as they are critical to his proper development and growth. Naked oats contain up to 65 percent more lysine and twice the amount of methionine than conventional oats. Horses need fat, not just for weight gain but also as a cool energy source that doesn’t generate excess body heat when they work. Fat is a dense energy source; when grain fat content is high, you can feed your horse less of it. 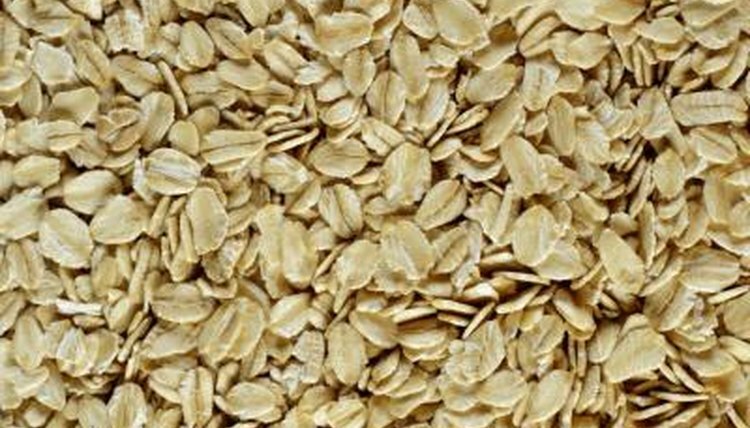 Oats are 5 percent to 12 percent fat, with naked oats on the higher end. If your horse is in a strict work program or if he has an excitable or nervous personality, a higher fat content can restore energy equilibrium and calm him down. Phosphorous is a mineral your horse needs for body maintenance. It serves as an electrolyte, balancing the fluid level in his cells. It’s important that your horse's phosphorous and calcium intake are about equal or that the horse take in slightly more calcium. Young horses in particular need more of both in their diet, at least until they’re 2. The ratio in conventional oats is fairly even, but there is significantly more phosphorous in naked oats. If you feed naked oats, consider adding alfalfa to balance this mineral ratio if oats is his primary food. Consult your vet regarding phosphorous and calcium balance, diet and any other health-impacting element of your horse care. Steamed or crimped oats will give your horse plenty of easy-to-digest fiber, but whole oats are considered slightly harder for him to digest. Naked oats have their hulls removed, which adversely affects the fiber content; but if your horse is getting plenty of fiber from other sources like hay or alfalfa, fiber intake not be an issue. Oats are high in starch, which also gives your horse energy. Kentucky Equine Research: Oats: The Perfect Horse Feed?